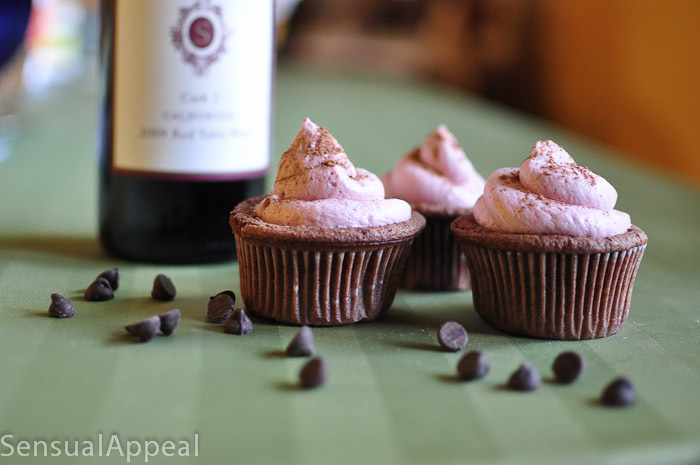 Before I dive into this delicious Chocolate Red Wine Cupcake recipe, let me say that I’d like to wish every mother out there Happy Mother’s Day! I know you put so much work and effort into raising your children and I want to say a big thank you, for putting up with us throughout the years! Also, I wish happiness to all of the women out there that want to be mothers or were going to be mothers.. sometimes things happen, but it’s the feeling! You still get to celebrate mother’s day! Thank you for being you! You are all wonderful women, inside and out! This post is dedicated to my own mother, Renata. I love her so much. I seriously don’t know what I would do without her. I can’t imagine life without her – she’s a dear friend and a wonderful mother. So then, I wanted to make her something special. While we all try to be healthy, we take some days “off” and celebrate with non-healthy options, unfortunately. I guess it’s okay to indulge sometimes though, right? Still better than buying completely processed foods! Even if your own baked good or dessert isn’t the healthiest, at least you know exactly what goes in it – because you are the one that made it! So I got to thinking… my mother loves to drink red wine. 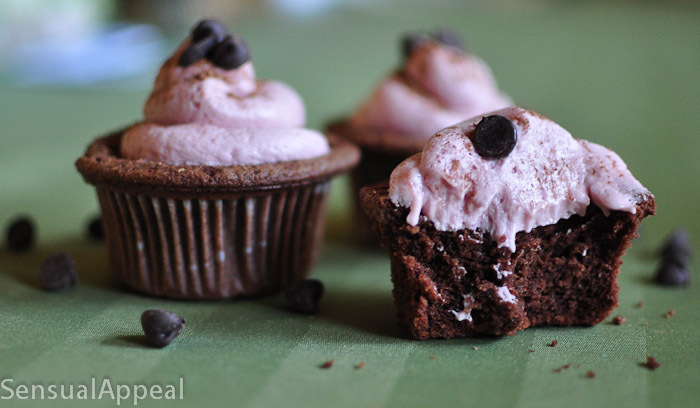 I love to make cupcakes as a celebration (because they are just so cute and fun!) so why not combine the two? That’s exactly what I did. I did not come up with these recipes – I didn’t even want to try to change these recipes up, I’m not experienced enough to do that just yet. So they haven’t been changed from the original. The outcome is wonderful. It is perfect for any red wine drinker! The cake part tastes primarily of chocolate, with a nice deep flavor, but finishes with a subtle wine flavor kick. It leaves a wine taste in your mouth. 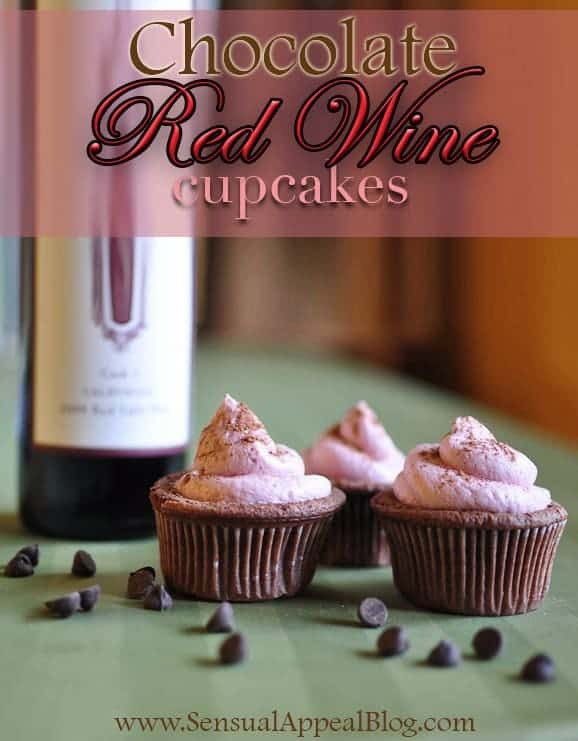 Together with the red wine buttercream frosting, the wine flavors are even more pronounced and create a deliciously sinful dessert – a chocolate red wine cupcake with red wine buttercream frosting. It tastes just as elegant as it sounds. Preheat oven to 350F. 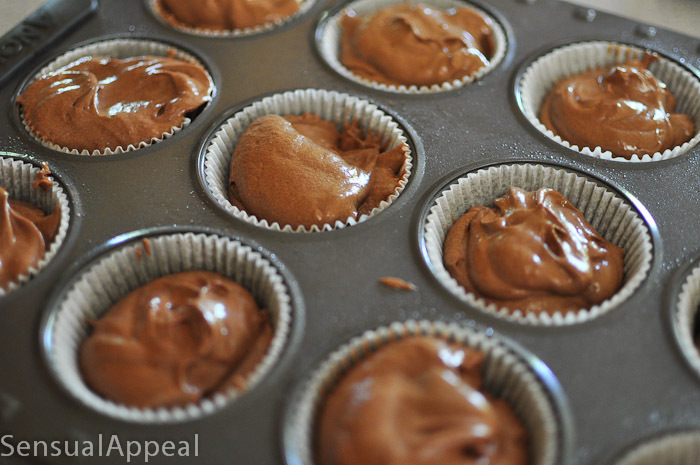 Line a muffin tin with 12 cupcake liners and spray them with cooking spray. 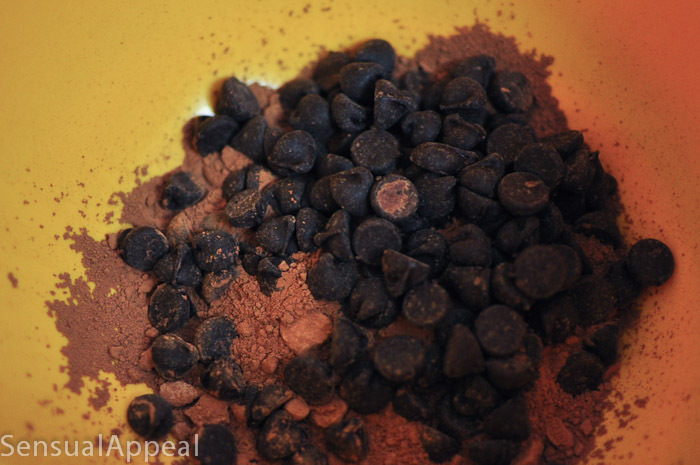 In a heatproof bowl combine cocoa powder and chocolate chips and pour in the boiling water. 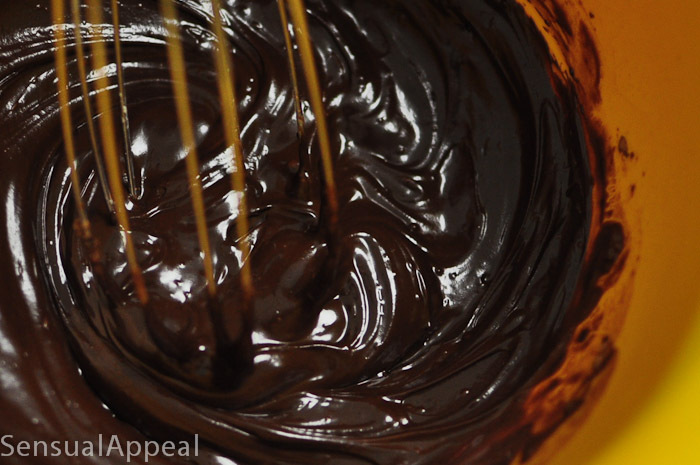 Using a whisk, stir the chocolate until it’s all melted. In a larger bowl, cream the butter and sugar together using a mixer. Then beat in each egg one at a time until they’re all mixed in. 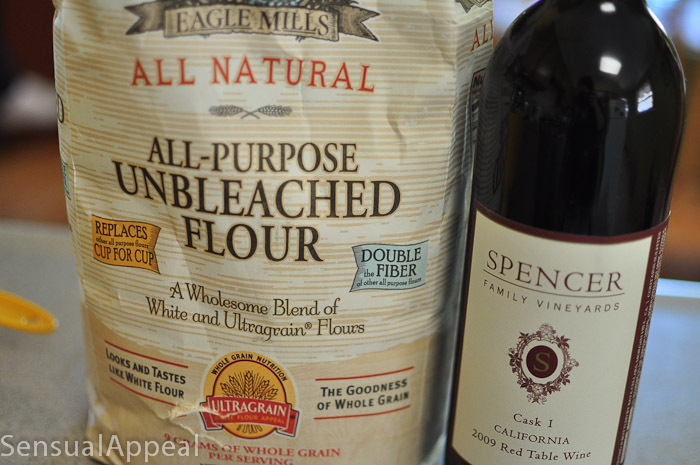 In a separate bowl combine the flour, baking powder, and salt. Then slowly add the flour mixture to the cream mixture until combined. Add some of the chocolate to the mixture, then some of the wine, alternating until all of it is blended. Pour batter into your papered muffin tins, almost all the way to the top. Bake in the oven for about 20 minutes, making sure the toothpick inserted comes out clean. Let the cupcakes cool completely before taking out of the tin. The cupcakes might fall and look sunken a little bit, which is okay. 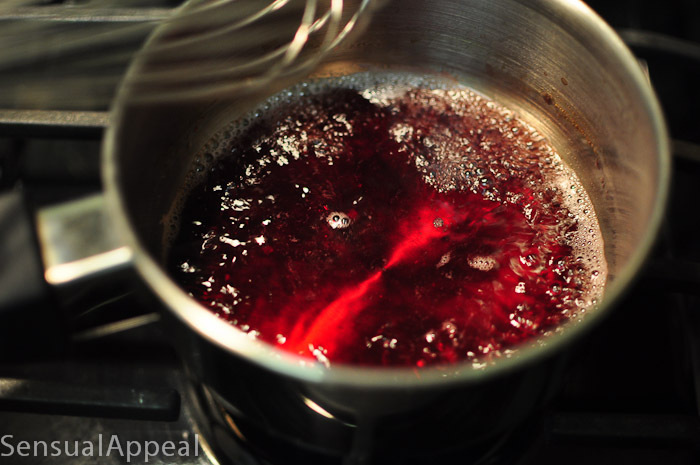 Once the cupcakes are cooled, go ahead and make the frosting…..
Place red wine and sugar in a small saucepan and cook over medium heat while stirring constantly until the sugar is all dissolved. Bring to a boil and then let simmer for a while, while stirring sometimes (not constantly). Cook until the syrup is reduced to about 1/6 cup. Put in a mug, let cool a little bit and stick in the fridge for a few hours to cool completely. 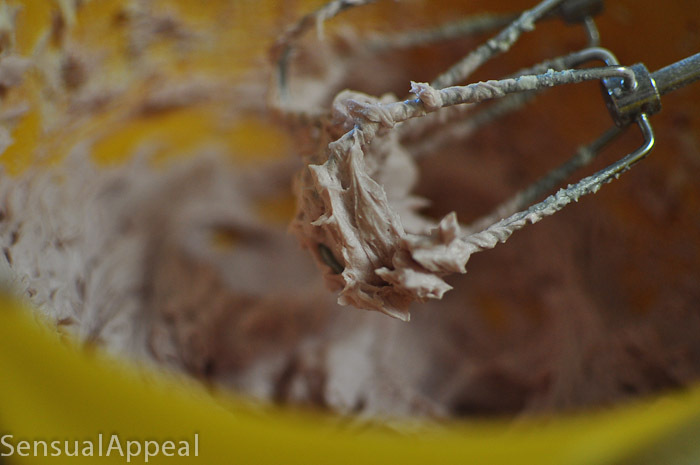 Whisk the butter while adding confectioner’s sugar to it by 1/8 cupfull. Cream together to form a frosting. Once a nice consistency is reached (almost all of the required confectioner’s sugar is in), add the wine reduction and continue beating. Add some more confectioner’s sugar. Then add 1 Tbsp of red wine. Add more confectioner’s sugar if desired. Place the mixture in a piping bag (or ziplock bag, which is what I did here) and frost the cupcakes. 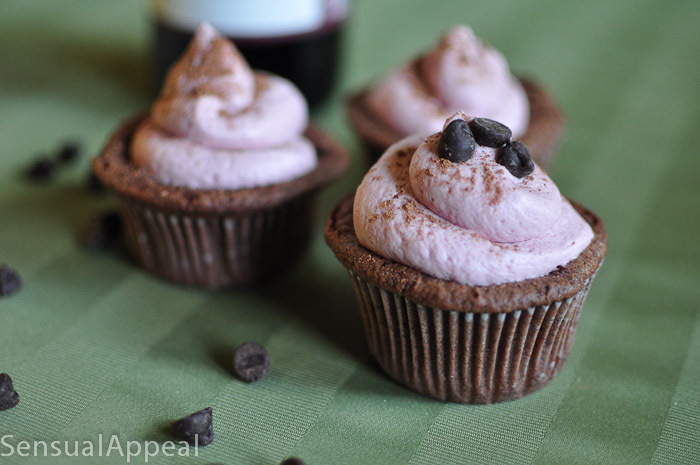 I have an updated recipe for these Chocolate Red Wine Cupcakes! The recipe is a bit healthier and just as delicious, but definitely worth checking out. See the new recipe here! Have you ever had a boozy dessert? What was it? These are so pretty.. your mom must have been so impressed! I hope she enjoyed her Mother’s Day!! Thank you! She said she loved them. Thank Goodness! haha. I hope you enjoyed yours as well 🙂 Happy Mother’s Day to you and all of the mothers in your life! Really beautiful! Red wine and chocolate – must be terrific together. What a lovely treat for your mom. These look delicious and so professional! You are such a great daughter. I gave my mom rocks for mother’s day, haha. Oh my, oh my. I think these have the capability to change a life. They look SO good! These are really beautiful cupcakes. Hello. I have Celiac’s Disease and love to bake. I substituted GF Baking flour added xanthum gum and baking soda and I AM I HEAVEN!!! Thank you for such a wonderful recipe that was easy to convert to Gluten Free and SOOOOO delicious. That’s fantastic to know, thank you for sharing the success with converting to GF! I’m trying to use more GF baking myself now so this is totally helpful – thank you and I’m happy you liked! Have a great rest of your weekend, Rebecca! These cupcakes look absolutely gorgeous and I can imagine what a treat they must have been. 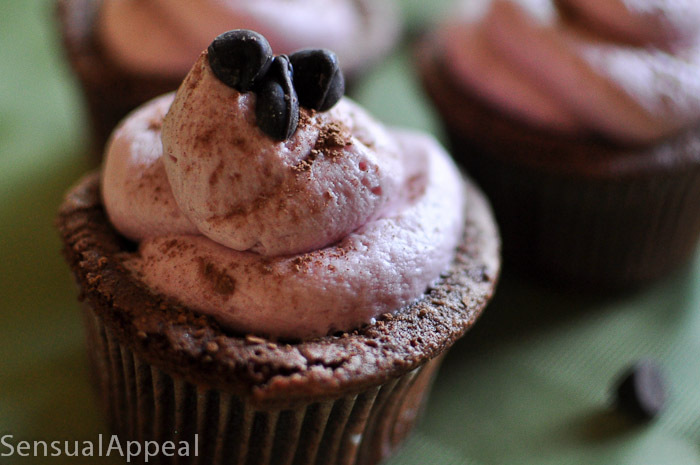 Thank you so much for sharing the recipe at Tasty Tuesday. I am featuring it this week. Hope you’ll drop by this week and share some more fabulous recipes with us.